Do you know how long i have waited for this specific feature? Though GBWhatsapp had already rolled out this feature in their latest and last released version but the issue is that not everyone makes use of GBWhatsapp. Anyways it’s now official as Whatsapp has finally rolled out the Revoke feature which allows you to Unsend or Recall sent messages to recipient. No phone type and version is left behind as this feature has also been rolled out and made available on the official Whatsapp version on App stores for Android, iOS including Windows phone. Few Info on recall feature from Whatsapp. This feature doesn’t work on Symbian phones. This newly released feature is called Delete for Everyone or Delete for me. With this post, I’d show you guys how to use the the Delete for Everyone feature and the Delete for Me feature, just tag along. 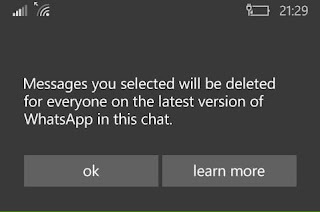 Deleting messages for everyone allows you to delete specific messages you have sent to either a group or an individual chat. Tap and hold the message > choose Delete from the option. 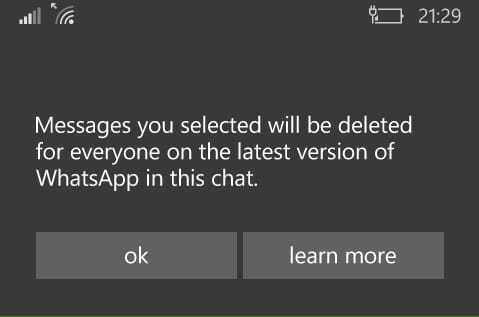 Optionally, select more messages to delete multiple messages at once. Then tap Delete >> Delete for everyone. Deleting messages for yourself allows you to delete your copy of messages you’ve sent or received from your phone. Then tap Delete >> Delete for me. What do you guys think about this feature? Thanks for the info, i hope they will keep on with their good job. grt job from whatsapp always adding features to the app so as to make it top among others. the best app so far I ever conquer.